About 167 guests on Royal Caribbean's Oasis of the Seas are afflicted by a stomach virus, according to Royal Caribbean officials. WESH is reporting the guests affected by the short-lived illness are being treated by the ship's medical team with over-the-counter medication. “We are bringing additional medical staff on board and we're engaging in intensive sanitary procedures to minimize the risk of any further issues,” a statement from Royal Caribbean said. Oasis of the Seas is on a 7-night Caribbean cruise from Port Canaveral, Florida. UPDATE: The number of sick guests has increased to 277. UPDATE: Royal Caribbean has decided to cancel the rest of the Oasis of the Seas sailing due to the outbreak. The Miami Herald is reporting that Oasis of the Seas will cut its current cruise short. Royal Caribbean said all passengers will receive full refunds for their cruise fare. More than 300 passengers Royal Caribbean's Independence of the Seas experienced an onset of gastrointestinal illness on the most recent 5-night Caribbean cruise. Many news outlets are reporting on the incident, in which the passengers affected reported symptoms that included bouts of vomiting and diarrhea. Royal Caribbean said in statements to media outlets that 332 of the 5,547 passengers and crew became ill. Guests were notified of the incidents during the sailing, with over-the-counter medicine provided to treat symptoms. Guests onboard also reported round the clock work by the crew to sanitize the ship throughout the duration of the sailing. According to the Centers for Disease Control, around 20 million people are infected with Norovirus each year with less than 1 percent of out breaks occurring on cruise ships. The Centers for Disease Control (CDC) has reported 3% of the guests and 1% of the crew aboard Royal Caribbean's Anthem of the Seas have reported being ill during the February 21 - March 4, 2016 voyage. The CDC report shows 125 guests and 16 crew members reported symptoms, such as vomiting or diarrhea. planning for sanitation of terminal and transport infection control procedures. Two CDC Vessel Sanitation Program environmental health officers and an epidemiologist will board the ship in Bayonne, NJ on March 2, 2016 to conduct an environmental health assessment and evaluate the outbreak and response activities. Specimens have been collected and will be sent to CDC for testing. Anthem of the Seas voyage was cut short, but Royal Caribbean reports the reasoning was not the illness, but a forecasted storm in the path of the ship. Some #AnthemoftheSeas guests have experienced norovirus symptoms. About 10 per day from 6,000 total pop. Didn't affect decision to return. Australian health authorities are reporting about 182 passengers aboard Royal Caribbean's Explorer of the Seas have been sickened with a gastrointestinal virus during a recent cruise. Royal Caribbean notified the South Eastern Sydney Local Health District of the virus. No patients required treatment at a hospital, although paramedics were on hand when Explorer of the Seas docked at the Overseas Passenger Terminal at The Rocks just before 6am on Wednesday. A representaive from the South Eastern Sydney Local Health District indicated the ship would undergo extra cleaning to control the outbreak prior to new passengers being able to board. 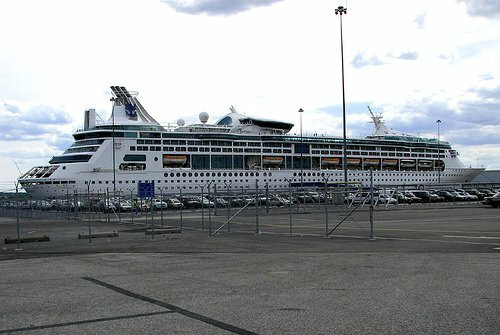 Explorer of the Seas recently arrived in Australia to begin her cruising season just last month. 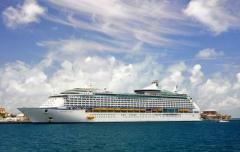 Explorer of the Seas last experienced a Norovirus outbreak in January 2014. The Centers for Disease Control is reporting Royal Caribbean's Legend of the Seas experienced an outbreak of gastrointestinal sickness that affected 114 passengers and 2 crew members. Those affected by the sickness experience symptoms such as vomiting and diarrhea. 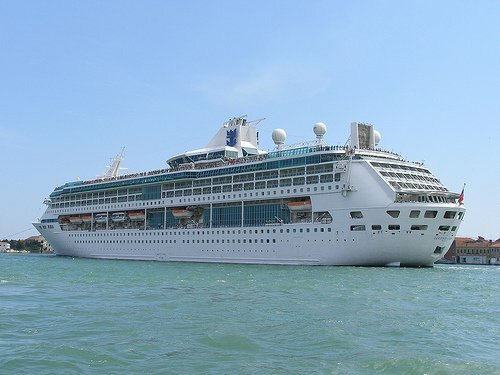 Legend of the Seas is currently on a two week cruise that started on March 30 and continues until April 14, 2015. Cruise lines are required to report the total number of gastrointestinal cases, with online updates posted when they account for more than 3 percent of passengers and crew. The outbreak on Legend of the Seas is affecting 6.53% of the passengers and 0.27% of the crew. Royal Caribbean is undertaking direction from the CDC to inhibit the sickness and prevent further outbreaks, including increasing cleaning and disinfection procedures making announcements to notify onboard passengers and crew of the outbreak, encourage case reporting, and encourage good hand hygiene. Once Legend of the Seas returns to San Diego, CA, Royal Caribbean will provide additional cleaning crew to complete a thorough public and accommodation super-sanitization cleaning and disinfection, plan staged disembarkation for active cases to limit the opportunity of illness transmission to well guests, and plan for sanitation of terminal and transport infection control procedures. Royal Caribbean's Grandeur of the Seas returned home to Baltimore today a day early after a number of passengers became sick on the cruise. Royal Caribbean spokesperson Cynthia Martinez said 193 guests(9.91 percent) and nine crew members(1.15 percent) experienced the illness, thought to be norovirus. "Those affected by the short-lived illness are responding well to over-the-counter medication administered on board the ship," Martinez said. The ship will undergo a ship-wide cleaning and disinfection after the guests disembark. The terminal will also be sanitized. When the ship was in Falmouth, Jamaica, two CDC Vessel Sanitation Program environmental health officers boarded the ship along with two epidemiologists. They collected samples for testing and evaluated the outbreak and response activities. Royal Caribbean is investing $2 million to help prevent Norovirus gastronomic illness from infecting their cruise ships. Royal Caribbean has extended its contract with ByoPlanet International and added $2 million to fund the company's disinfectant technology that prevents Norovirus on ships. Royal Caribbean bought 350 additional ByoPlanet sprayers to add to the existing 10-30 sprayers they have on each cruise ship. The disinfectant works by spraying electrically charged disinfectants that wrap around surfaces to kill mold, odors, mildew, bedbugs, algae and parasites. Royal Caribbean has been a partner of ByoPlanet since 2010. 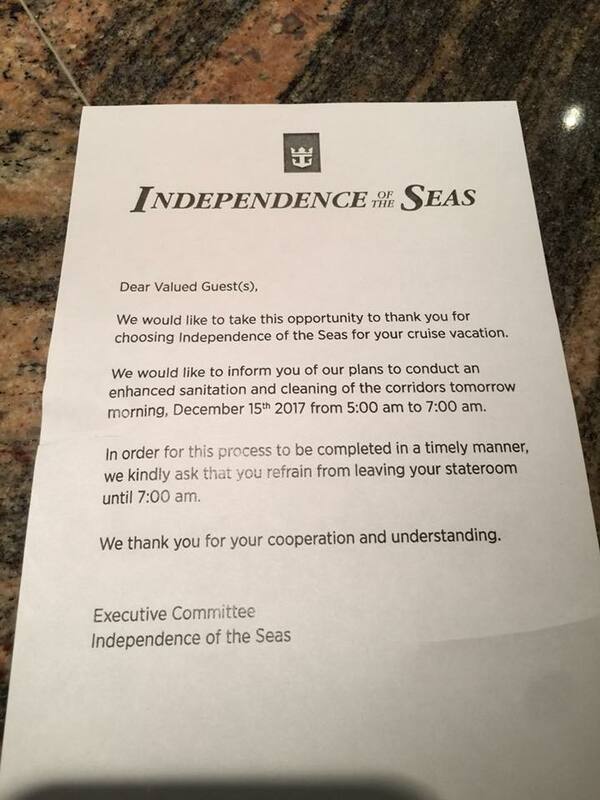 Royal Caribbean's Grandeur of the Seas is dealing with a gastrointestinal sickness that has broken out on the ship for the second time in two weeks. The Centers for Disease Control and Prevention is reporting almost 100 passengers on the Grandeur of the Seas cruise that left Baltimore on April 5th. Royal Caribbean spokeswoman commented, "Those affected by the short-lived illness have responded well to over-the-counter medication being administered onboard the ship." A cruise that departed Baltimore March 28 on the same ship also had an outbreak of viral illness that the CDC said was caused by norovirus. During that cruise, more than 100 passengers became ill. Fewer than a dozen crew members were sickened. 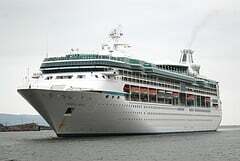 Grandeur of the Seas is expected to return to Baltimore as scheduled Saturday morning. Upon its return to Baltimore, the ship is expected to be thoroughly sanitized. In addition, "two CDC Vessel Sanitation Program environmental health officers and an epidemiologist will board the ship," as part of the ongoing investigation, according to disease control officials. The tests are in and the Centers for Disease Control (CDC) confirmed that Norovirus was indeed the culprit in over 600 cruise passengers getting sick on Royal Caribbean's Explorer of the Seas last month. The CDC says the particular strain of Norovirus was identified as the GII.4 Sydney strain, which is named after originating in Australia. Furthermore, the CDC confirmed today that it is the most common norovirus of about 20 different types in the country right now. In fact, it affects many more people on land than on cruise ships. In fact, according to the CDC, over 21 million people are infected with Norovirus each year with less than 1 percent of out breaks occuring on cruise ships. The GII.4 Sydney strain was identified in 2012 in Sydney, Australia. Sadly with the outbreak of Norovirus on Royal Caribbean's Explorer of the Seas, there's a lot of attention being put on this nasty little bug. The good news is if you are going on a cruise, there are steps you can take to avoid getting infected too. It's important to understand how Norovirus is spread to be able to avoid getting it. Norovirus is acute gastroenteritis, which generates symptoms such as vomiting, diarrhea and stomach pain. 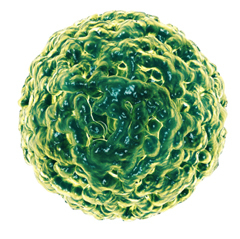 Norovirus is spread from person to person through food or water that is contaminated with the virus as well as touching contaminated surfaces. The Centers for Disease Control (CDC) says Norovirus is commonly spread by contact with people who are infected by the virus. How can you avoid getting Norovirus? First and foremost, washing your hands thoroughly with warm water and soap prior to eating or drinking is the best defense. In addition, washing your hands after using the restroom is always a good idea. If someone you know is sick, keep in mind they can spread the disease up to 3 days after they recover so avoid contact with them. If an outbreak happens, also refrain from shaking hands. If any clothing is contaminated with vomit or stool, be sure to wash the clothing immediately to avoid the spread of the virus. Norovirus requires you to get in physical contact with it. It's not spread via the air and with good hygiene, you can stand a good chance of avoiding getting sick.